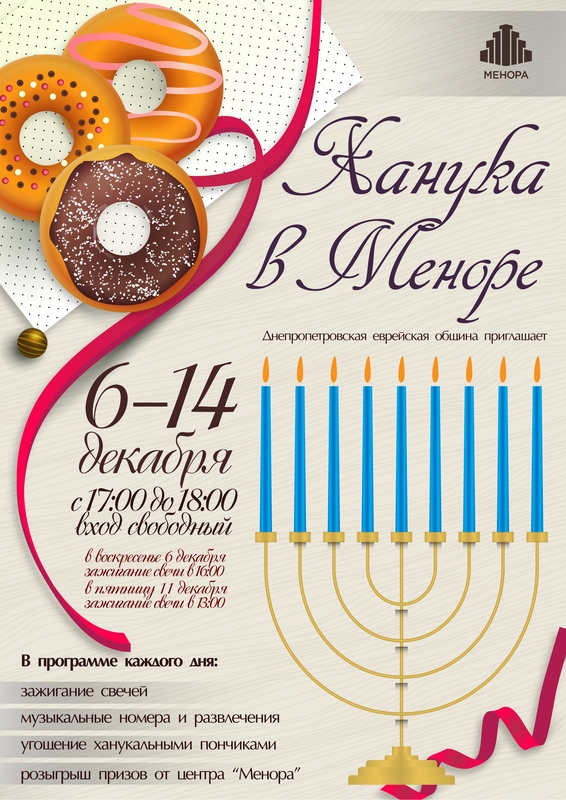 From 6 to 14 December, the Menorah Center invites all citizens and guests of Dnepropetrovsk to join the celebration of Hanukkah, the ancient holiday of light. The festivities will take place daily from 17:00 to 18:00. On Sunday, December 6, lighting of the first Hanukkah candle will take place at 16.00. The lighting of the Hanukkah candle will take place at 13.00, on Friday, Dec 11. • drawing of prizes and gifts from the Menorah Center. Enjoy Hanukkah with the Menorah Center!